Mon., Jan. 22, 2018, 10:38 p.m.
MELBOURNE, Australia – Even by Australian Open standards, back-to-back shockers have resulted in a most unexpected quarterfinal. The season-opening Grand Slam has a tendency to be unpredictable, but losing six-time champion Novak Djokovic and fifth-ranked Dominic Thiem within a few hours on Monday leaves Hyeon Chung and Tennys Sandgren playing for a spot in the semifinals. The 58th-ranked Chung relentlessly attacked a clearly injured Djokovic in a 7-6 (4), 7-5, 7-6 (3) fourth-round victory, becoming the first South Korean to reach the last eight at a Grand Slam. Then there’s Tennys. The 26-year-old from Tennessee had never won a Grand Slam match or beaten a top-10 player until last week. The 97th-ranked Sandgren beat Thiem 6-2, 4-6, 7-6 (4), 6-7 (7), 6-3, following up on his earlier victory over 2014 Australian Open champion Stan Wawrinka. He’s only the second man in 20 years to reach the quarterfinals in his debut at Melbourne Park. The bespectacled Chung ripped 47 winners, including a forehand on the slide and at full stretch that put him within two points of victory, and credited Djokovic as his inspiration. Djokovic was playing his first competitive tennis since Wimbledon last July, and had to remodel his service swing to take some load off his injured right elbow. He winced and grimaced throughout the match, particularly when stretching for backhands, and needed a medical timeout in the second set for massage on his injured elbow. The 12-time major champion said he would need to reassess the injury, but didn’t want his pain to detract from Chung’s win. Chung was coming off a win over fourth-seeded Alexander Zverev, and is on a roll. 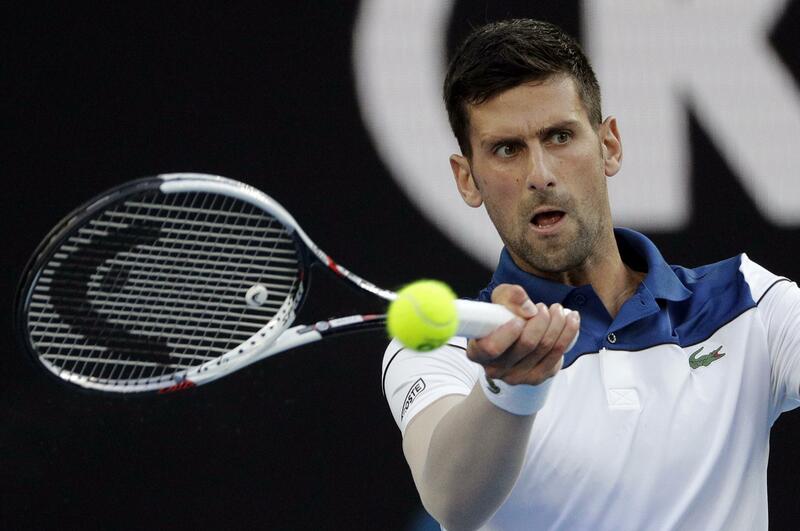 Djokovic wasn’t even sure until the last minute that he would be able to play at Melbourne Park, but was fit enough to beat Donald Young, Gael Monfils and No. 21 Albert Ramos-Vinolas. Chung was a different proposition. “I had similar situations in the past where I found myself struggling a little bit with some injuries during the match, then I managed to win,” Djokovic said. “I felt the level of pain was not that high that I need to stop the match, even though it was obviously compromising my serve. The 26-year-old Sandgren missed a match point in the fourth set but held on to beat Thiem. Sandgren converted half of his eight break-point chances, and fended off 10 of the 12 he faced against Thiem. He hit 63 winners against 38 unforced errors. “Trying to keep riding the wave,” said Sandgren, who was given his first name in memory of his great-grandfather. Defending champion Roger Federer, meanwhile, had no real difficulties in reaching the Australian Open quarterfinals for the 14th time. He beat Marton Fucsovics 6-4, 7-6 (3), 6-2 and will next renew a lengthy rivalry against Tomas Berdych, who had a 6-1, 6-4, 6-4 win over Fabio Fognini. The win over Fucsovics was Federer’s first day match of the 2018 tournament, and he joked about needing sunglasses and a towel for the beach but said really the only change was to set the alarm for a different time. Angelique Kerber, the only Grand Slam singles champion remaining in the women’s draw, was up earlier than Federer, and got a serious wakeup call. For a while it appeared former the Australian and U.S. Open champion’s tournament could unravel against No. 88 Hsieh Su-wei, a former top-ranked doubles player with a double-handed grip on both sides. Kerber recovered for a 4-6, 7-5, 6-1 win that earned her a quarterfinal spot against U.S. Open finalist Madison Keys, who beat No. 8 Caroline Garcia 6-3, 6-2. Halep will next play sixth-seeded Karolina Pliskova, who rounded off Day 8 with a 6-7 (5), 6-3, 6-2 win over No. 20 Barbora Strycova. Published: Jan. 22, 2018, 10:38 p.m.